emmatree: Oh ye of little . . . .
No disrespect intended for the parishioners of this little place, but I'm just saying . . .
i'm shaking my head and smiling...not just for the sake of the sign but for your own comment. cute :) do you have a birthday tomorrow? You always find the best signs! Jaime & Robin - I just think East Texas has a lot of funny signs. Next time I'm near this one, I'm gonna drive down the road & check out the church. 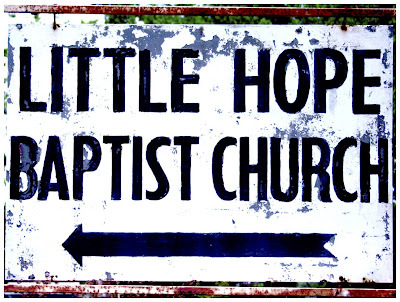 I personally would prefer attending Lotsa Hope Baptist. Robin - No, my birthday is a long way down the road. It's Lyndi's birthday (or as I call her, Lyndi-Linda). She's Mary's wonderful caretaker & I'm not sure what any of us would do without her.